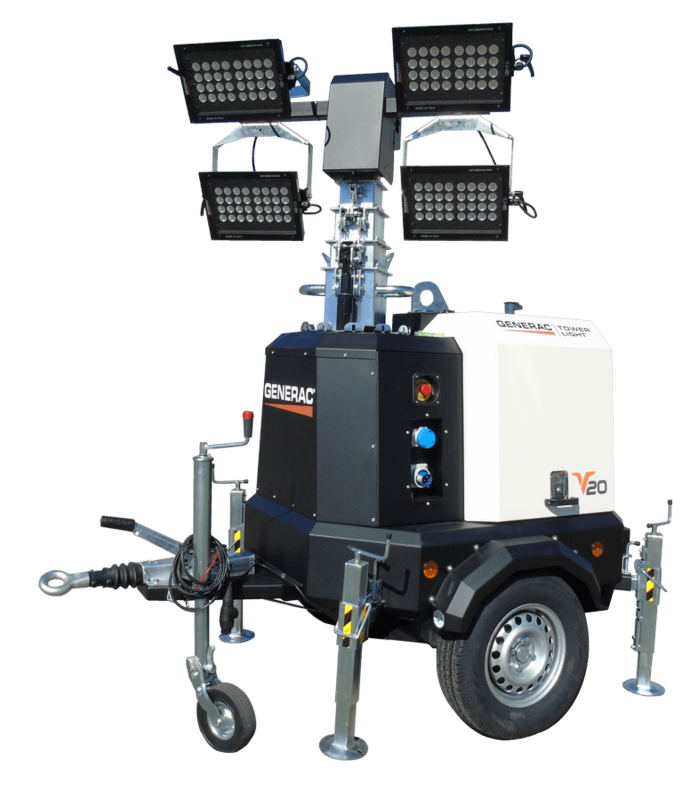 The V20 light tower is a brand-new mobile light tower equipped with 4x320W high efficiency LED lamp floodlights. More than 160 hours of running time and one of the lowest sound pressure level in the industry: only 58 dB(A) at 7 meters. The V20 is equipped with a GTL01 digital controller specifically studied to manage every function of the light tower for the best ease of use. 4 x 320W high efficiency LED floodlights designed by Generac Mobile®. The floodlights are powered with low voltage 48 Volts. No more high voltages on external cables. Safety as a must! 3 doors for a wider access. 2 compass-top doors with «wing» shape provide a complete access to the engine for a safe and convenient maintenance. 1 back door allows the access to the digital control panel. The special shape of the adjustable stabilizers allows the operator to level the V20 light tower in few seconds. Innovation means also decreasing the noise level! The V20 light tower emits only 58 dB(A) @ 7 meters. Thanks to the V20’s fuel saving features such as the small engine and the LED lamps, this model can run up to 167 hours without refueling. You can connect a V20 to another V20 and run two lighting towers with only one engine.